Guidelines on finding your dream home as per Vastu. Nowadays construction companies offer many amenities like swimming pool, gymnasium, park, walking track, yoga space etc. in their new residential projects. This trend has reached to towns from the metro cities to attract new buyers especially the younger crowd. Vastu is very effective in the process of buying and selling of the property. A seller can not make a deal if Vastu consultant point outs the issue which is missed during the construction. Many buyers considered it supremely important that a new home has good Vastu arrangements. The residential project as per Vastu is in great demand all over the world. Buyers looking for a new house with a sole aim to get more growth with new possibilities in life. A true Vastu compliant home can bring an abundance of prosperity, sound health and, also more tranquillity. Buying a property is the most important investment you will be making in your life. 1. Location and its surrounding:- Vastu mainly focuses on five key elements (Water, Fire, Earth, Wind and Space) along with the external environment of the house. Surrounding plays a very important role while deciding for a new house as per Vastu. Approaching and connected road, neighbors, river, canal, mountain or hill etc. has a huge impact on the energy of a house. For example, T-junction can bring serious bad luck to the occupant of the house. 2. Front door location:- Main door should always to be located in auspicious direction. This will help you to get the right opportunities to come in your life. The main entrance door represents the mouth of the energy, the space in which your house inhales a deep and cleansing breath. Location of the door in a negative zone block the flow of opportunities and even creates frequent obstacles in the life. 3. Positioning of different rooms:-Each room in the house have its own unique energy. According to Vastu each individual room, including the kitchen, living room, bedroom, passage and even guest room should locate in the correct direction as per Vastu. 4. Shape of the house:- Rectangular or square shape is most auspicious according to Vastu. A house with L shape indicates missing corner in the house. A corner cut towards the North-East, South-East and South-west falls under the “Major Vastu Defect” catagory. It has a negative impact on the luck and fortune of the owner of the house. 5. Previous history of the plot or house:- Avoid buying a property, which was used a a burial place in the past. If buying a resale property, Avoid house which has seen an incidence and events like bankruptcy, murder, serious disease, divorces etc. Place of worship like temple, mosques , church etc. Above surrounding location causes bad luck and hence are not suitable for the residential purpose. Our client staying in Mumbai has asked us to assist in selecting a Vastu compliant home in a new upcoming project in Ahmedabad city. 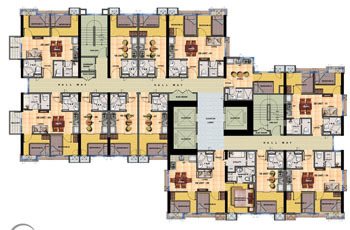 The project was a huge complex with the all modern & world class amenities. Planning of lake, clubs, commercial complexes along with residential complex has attracted a good amount of buyers –not only from the Ahmedabad but also from the Mumbai as well as the rest of the world. The dowsing of the site indicated a greater amount of positive power at the location. We were hired to select the best five apartment from the availability of houses with the builder. It was a very difficult task for the selection, as every apartment was having a closer view of the water body. Location of water body ( Each apartment has a closed view of water body):- Correct location of water brings prosperity and positive flow of energy. It helps to energize the cosmic flow of vibrations entering to the house. Houses or property located near water are considered more auspicious. Location of Main Door:-Second consideration was a main door which should be always in positive zone according to vastu. Main door is considered as a mouth of home from where the flow of energy enters to the house. Access to solar energy:-Location of Windows towards the east were considered carefully while making suggestions based on vastu. Sun is the source of energy – Solar energy is the force for sustaining life on Earth. The early morning rays from the East are always beneficial. The Sun rays are also a source of Vitamin-D, which is very essential for good heath. Flow of magnetic forces:-Flow of magnetic forces also need to be considered while making a buying decision. The earth magnetic forces flows from the north to south direction. We always recommend property with a longer North-south axis. We have to always view the plan from point of view of the modification/correction at the design stage. Internal placement in the kitchen, Allocation of bedrooms based on activities , Bed location, Furniture plannings, mirror & gadgets placement etc . should always possible to incorporate in the new house. We were able to help our client to decide on Vastu complaint home with the best feature available for his benefit. Some minor remedies were required as some placements can not be shifted due to plumbing system was difficult to shift. We have provided our Vastu services in India’s best Upcoming Real Estate Projects in Ahmedabad, Dholera, Vapi, Daman, Umargam, Surat, Delhi, Udaipur, Jaipur, Rajasthan, Mumbai, Thane, Navi Mumbai as well as Pune.